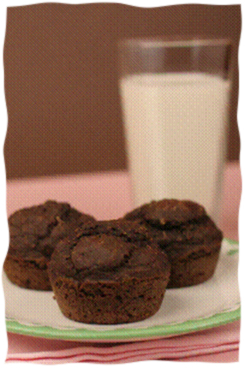 These muffins are big hit with my children. If you have an occasion and want a cake, make a cake by baking this recipe in a 9" round cake pan for about 20-25 minutes. And, if you need to avoid wheat, you can substitute the wheat flour with 1 cup oat flour and ½ cup brown rice flour. Oat milk is a non-dairy milk that has a slightly sweet taste and is great for baking. You can locate oat milk in your local health food store. Preheat oven to 350 degrees. Beat the banana, oil and egg until creamy. Add in the milk and vanilla extract. Stir in the remaining ingredients and mix until just combined. Spray nonstick muffin pan with cooking spray. Fill each cup 2/3 full. Bake for 13-15 minutes until the tops spring back when touched. Naomi Muller has been cooking for 30 years (and she is only 42 years old) and has endured many requests to go into catering. Instead, she decided to create a cookbook of over 150 healthy recipes which is the only kosher cookbook of its kind.